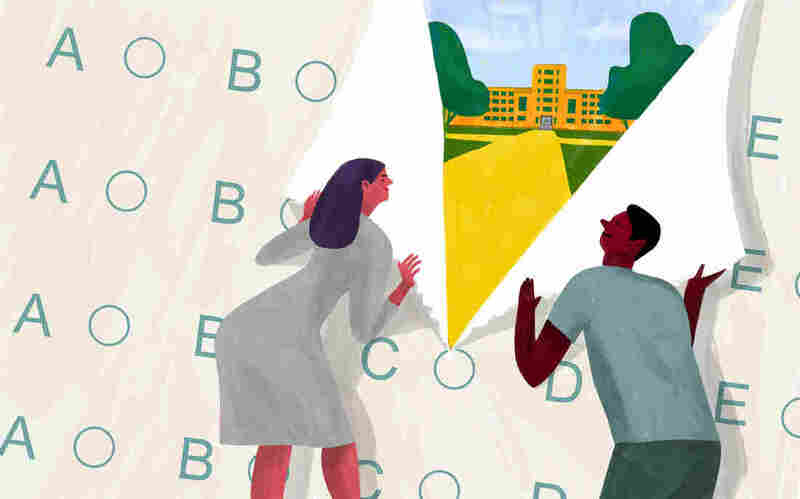 NPR Ed - Weekly Roundup 6/16 : NPR Ed Also in our weekly roundup of education news, the University of Chicago makes test scores optional for applicants. This week, educators and students expressed their opposition to the College Board's decision to cut out parts of the Advanced Placement World History curriculum. The College Board announced in May that it was removing early world history from the nationally taught high school course. Starting in 2019, the AP World History exam will only assess content from 1450 to the present. Schools will have the option to offer a Pre-AP World History course that covers 600 BCE to 1450 instead, but it will not count for college credit like other AP courses. The flood of support for teaching early world history started after outraged teachers vocalized their concerns at an during an open forum with College Board members in Salt Lake City, Utah. Several college professors who have worked on the AP World History exam sent a letter of protest to higher ups at the College Board. A high school freshman, Dylan Black, started an online petition to keep early history in the curriculum — and so far, it has more than 8,000 signatures. "I would argue that we shouldn't cut any of it," Amanda DoAmaral, one of the teachers at that forum, told NPR. DoAmaral got into an argument with College Board Vice President Trevor Packer during a Q&A session. In an interview with NPR's Weekend Edition, she recommended improving the organization of the current course and providing training for AP World teachers instead of reducing the time period taught. Packer said he was "deeply moved" by the feedback from teachers in statement released last week. He pledged to take another look at the curriculum and to release a final report in mid-July. On Tuesday, Google announced it would aggregate detailed information about four-year universities and display it at the top of search results about schools. Statistics like admissions records, cost, majors, post-graduation employment rates and ranking are included. The company said this function will help students access information that is crucial to the college application process but not always easily found. When considering colleges, information like acceptance rates and job prospects out of college can shape how a student chooses a school. Google compiled the statistics from the College Scorecard, a database created under the Obama administration to help students access more helpful data about schools. The new search tool will also pull from the Integrated Postsecondary Education Data System, data each school sends to the Education Department. That's all in addition to working with researchers and admissions officers. The feature is currently available only on mobile browsers with an abbreviated version available on desktop. The University of Southern California is under investigation by the Education Department's Office for Civil Rights for its handling of sexual harassment allegations. The office is reviewing how USC handled complaints about Dr. George Tyndall, the former university gynecologist who is accused of behaving inappropriately during medical exams. Complaints range from unnecessary touching to making sexual comments about patient's appearances. The Office for Civil Rights says the university did not disclose complaints during previous investigations. There were 52 reports of harassment as far back as 1990 that were not fully investigated until 2016. USC has faced an increasing number of lawsuits and calls for accountability since the Los Angeles Times' published an investigation into Dr. Tyndall's behavior in May. The university has since started their own investigation and established a hotline. The University of Chicago will no longer require U.S. applicants to submit standardized test scores from the SAT or ACT for admission, the university announced on Thursday. Several well-known colleges have already gone test-optional in their admissions. Research has shown that standardized test scores have little correlation with a student's college performance. Test-optional schools have been able to enroll more students from diverse backgrounds. The change is part of UChicago's expanded efforts to make their undergraduate programs more accessible for under-served students. All applications will now go through a "holistic review process." There is no "one piece of information" that would determine which applicants would be a good fit. "We want students to understand the application does not define you – you define the application," James G. Nondorf, UChicago's vice president of enrollment, said in a press release. Harvard University defended its admissions practices this week after a group suing the university filed court documents claiming that the school discriminates against Asian-American applicants. The court filings are part of a lawsuit brought in 2014 by Students for Fair Admissions, the same group that previously challenged the University of Texas at Austin's affirmative action policy. In a letter sent to the school community earlier in the week, Harvard President Drew Faust wrote that the university "will stand behind an approach that has been held up as legal and fair by the Supreme Court, one that relies on broad and extensive outreach to exceptional students in order to attract excellence from all backgrounds." The case is expected to go to trial this fall.